Inspirations and modifications | Sew Lindsay, Sew! I get the most brilliant ideas in the most inopportune places. Having a lightbulb-over-my-head moment is so inconvenient when I’m pushing through the last few minutes of an evening run, driving 70mph on the highway or rinsing conditioner out of my hair. I have to wonder how many wonderful ideas float out of my head, never to return again simply because I don’t have a means of writing them down when they come into my life. Luckily, one shower-sewing-inspiration a few months back was so promising that I started mapping out a plan in my head before my hair was even dry. My dear friend’s birthday was approaching and I wanted to make her something memorable. 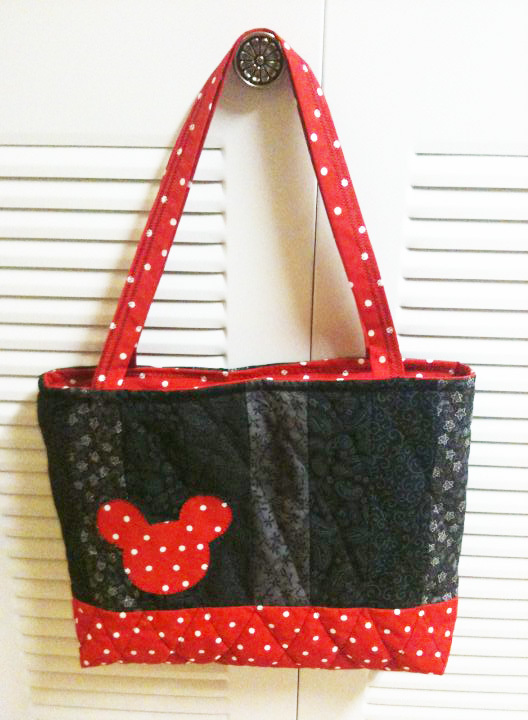 Because we share a special understanding about the magic of Disney, I used Minnie Mouse for inspiration and made a Friendship Bag using the same modified measurements I wrote about a few posts back. 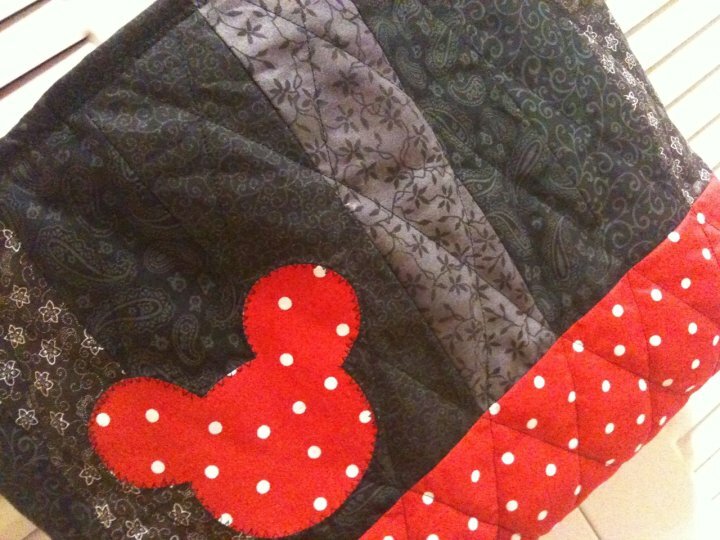 A variety of black calico prints + a red/white polka dot fabric + a magical, inspirational mouse = One successful sewing project! For an extra magical touch, I added a mouse-head applique using a really amazing product called Heat’n Bond Iron-On Adhesive. 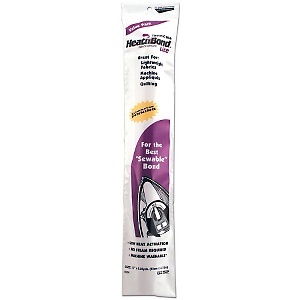 It’s available near the ironing supplies in the fabric store for around $10/roll and comes in a variety of adhesive strengths to turn any fabric into an iron-on piece. Since I planned on stitching around the border, I only needed to use the lightest strength to iron my applique in place. Non-sewers would appreciate Heat’n Bond Ultra Hold adhesive – no sewing required! 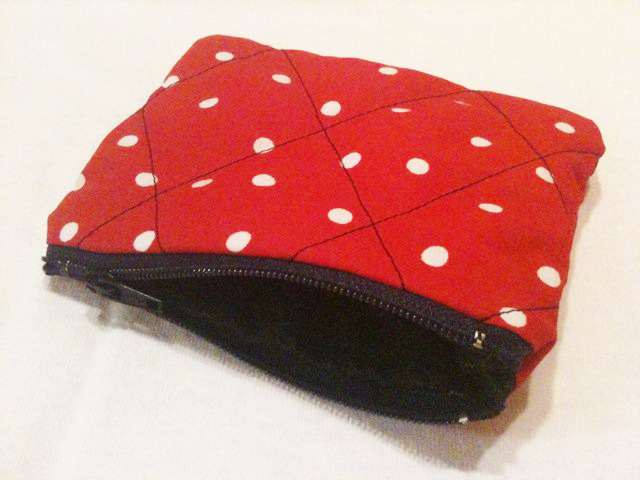 And last, I created a little coin pouch – my first experience with a zipper. I had to mix and match a few different online tutorials to create the exact quilted zipper coin pouch I had in mind, but overall it wasn’t very difficult. Zippers look more intimidating than they really are! Heat’n Bond is an amazing product for creating appliques, and may even be useful for non-sewers. Am I the only one who gets inspired in strange places? Oh good, I’m glad I’m not alone! I also use my iPhone for jotting ideas… the “Use Your Handwriting” app is awesome for writing something down quickly! Your Minnie Bag is adorable! Pingback: The Friendship Bag: Rinse and Repeat! « Sew, Lindsay, Sew!